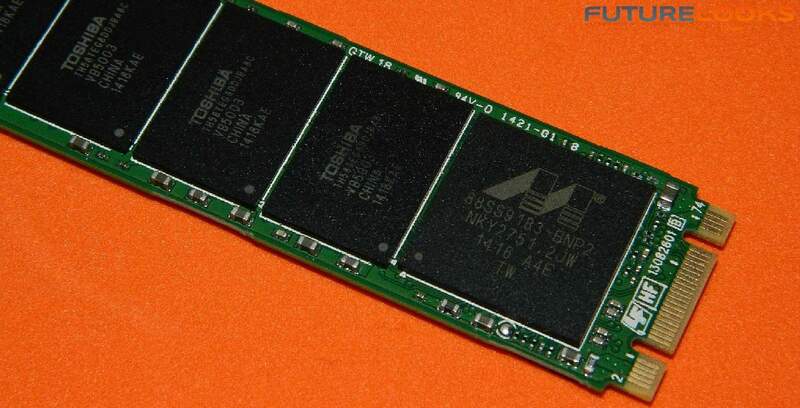 Compared to mSATA SSDs, M.2 PCIE SSDs have far more potential in the desktop market. mSATA has a much lower bandwidth limit than M.2. In fact, M.2 utilizes the PCIE lanes to transfer data which means much higher potential. Also, while mSATA is limited to its own little port, M.2 PCIE SSDs can be plugged into PCIE adapter cards. giving older systems a boost in performance, or it can provide an additional slot for fast storage when the main slot on the motherboard is already in use. Although M.2 PCIE SSDs currently come in x2, x4, how much faster are they in real life? That's why we have the Plextor PX-G256M6e in our lab today to find out! What makes this thing tick? Two components do the bulk of the work - the system's PCIE bus carrying all the bandwidth and a Marvell 88S9183 dual-core controller. The controller reads and writes non-volatile data to 8 x 32GB 19nm Toshiba NAND chips which totals 256GB on the PX-G256M6e device. Future models may implement different NAND which is no big deal as long as the performance is the same, or is improved. A single 512MB Nanya DDR3 RAM chip acts as cache to support the controller functions. The PX-G256M6e supports TRIM, SMART, and NCQ to manage storage cells to improve performance. Surprisingly, the device also has AES 256 encryption to keep data relatively safe. Whether or not that is successful ultimately depends on the tenacity and time of the hacker. 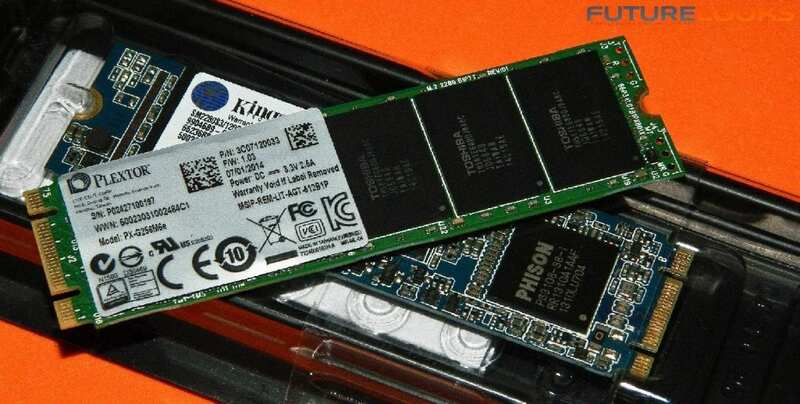 In terms of pricing, the PX-G256M6e retails for around the $220 US price range, which is priced competitively with other PCIE SSD solutions, but is a premium over standard SATA3 SSDs in the market at the same capacity. 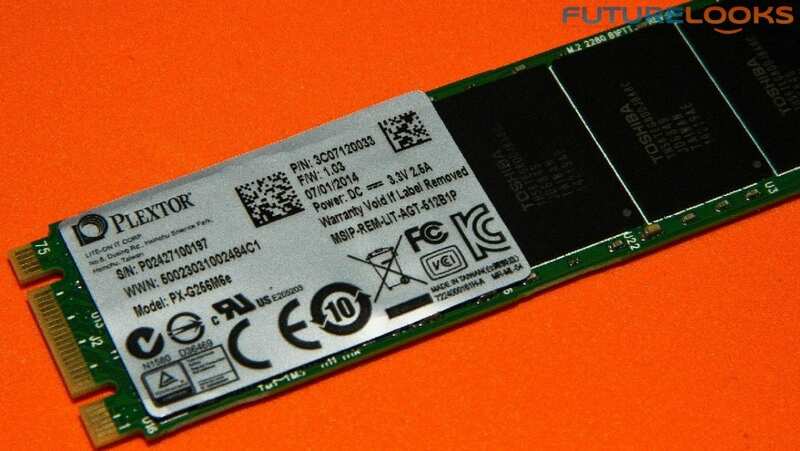 However, M.2 PCIE SSDs do have an advantage in speed, which we'll be looking at closely. Intel Z97 and X99 motherboards are the latest platforms to offer an M.2 slot. For best performance, match x-gen SSD to x-gen port on your motherboard or expansion card. Otherwise, your M.2 device will scale back automatically, similarly to PCI Express slots when you put a slower card in there.That said, during installation the Plextor PX-G256M6e worked perfectly with the x4 gen slot on an ASUS X99 Deluxe motherboard. The Plextor PX-G256M6e also showed good compatibility with the bundled adapter card on the ASUS X99 Deluxe board. That means that if you have an older generation system without an M.2 slot, you can still take advantage of the performance with a similar adapter card. A fine solution for anyone still on an Intel X58 system that refuses to die. In terms of installation, basically, slide the golden fingers into the slot, then tighten down with a small screw. Upon boot up, if you see a Plextor splash screen, then you know your M6e elite M.2 SSD is working well. Sometimes, you'll see the screen for a couple seconds and other times for longer, but we're not exactly sure why. However, once booted into Windows, you can treat it like any other drive, format it, and put it to use. If you're using it as your system drive, you'll just have to set the drive as your first boot up device and you're good to go. In order to test the Plextor PX-G256M6e fully, we devised two systems based on the latest chipsets to support M.2 PCIE SSDs onboard. Shared components included an ASUS STRIX GTX 750 Ti 2GB OC video card, optional ASUS PCIE M.2 x4 expansion card, be quiet! DarkPowerPro 850W 80Plus Gold power supply, and Kingston HyperX Fury 240GB SSD. Both systems were fully patched under Windows 7 Ultimate, with the latest drivers and BIOS for all components available at the time of testing. Let's start benching!